One of the longest units for the eleventh grade in Kurikulum 2013 is the Expository Essay. 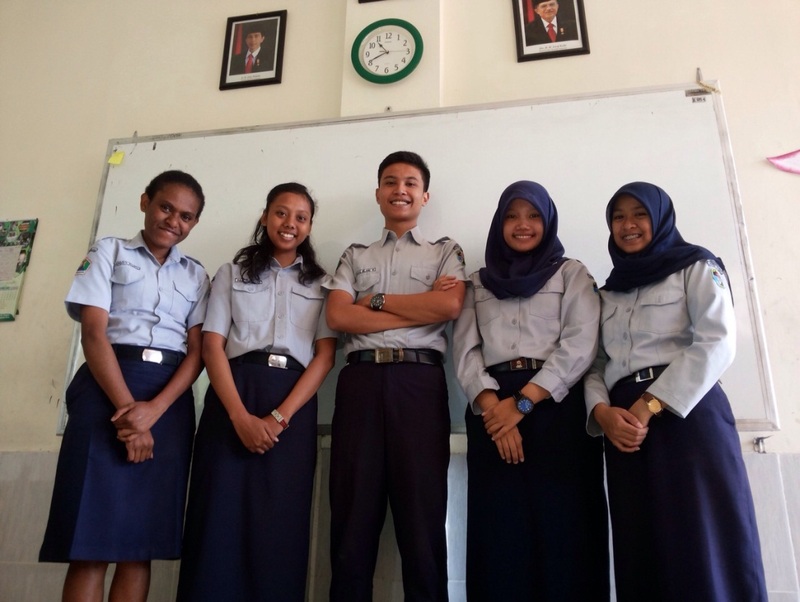 In order to help make writing group essays of this sort more authentic for their students, the eleventh grade teacher and ETA at SMAN 10 partnered with Indonesiaful to offer the students the opportunity to have their essays published. There are two tracks for students at SMAN 10, Science and Social, and the Science track students were also in the middle of a statistics unit at the time of the essay. This allowed for an interdisciplinary partnership as well, with two of the Math teachers: students were to complete a statistics study related to their essay topic and include some of the information they gathered in the essays they wrote for English class. Students wrote on a variety of topics, and in the eyes of their ETA, it was a privilege to witness them process the information they gathered, both from their own research and from external sources, to create their own arguments and eventual finished products. The following are original essays, written and revised by eleventh graders from SMAN 10 Malang. By: Aulia Zasabillah, Bagas Gilang, Ilham Faiqoh, Nobertha, Venia R.
Ten thousand foreign students want to study in Indonesia (Pikiran Online, 2013). But the goverment still doesn’t have an entrance test for foreign university students like other country. It is important, and very possible, to learn Bahasa Indonesia before studying in Indonesia. One place where foreign students can learn Bahasa Indonesia is in schools. As we know Australia already has a curriculum of Bahasa Indonesia. In Australia there are twenty-eight primary schools, fifty-one senior high schools, and two colleges that have Bahasa Indonesia in their schools (Liputan 2013). Bahasa Indonesia is the second languge in Australia (Kompasiana 2013). So it is very easy to learn Bahasa Indonesia in school. In other country, Tiongkok, there are some Bahasa Indonesia Programs in universities. The longest-running Bahasa Indonesia program is Peking University and that campus has a lot of students who learn Bahasa Indonesia in Yunan University (RRI , 2014). Although, in Tiongkoks Universities there are only a few of students who learn Bahasa Indonesia, The Attache of KBRI Education in Beijing keeps trying to increase the teachers, especially from Indonesia. So, the number of Tiongkoks students who study Bahasa Indonesia will increase too. The second place where foreign students can learn Bahasa Indonesia outside of schools. Learning through online can be one way. Like in Japan, many college students learn Bahasa Indonesia in an online course (Denpasar 2015). The name course is SIKI. If we learn online, we can choose the material, get a lot of vocabulary quickly, the picture is varied, and audio that supports learning. So, there are many foreign students who want to study in Indonesia. Even Bahasa Indonesia itself already popular in other countries. Although, foreign governments has been implementing various methods for Bahasa Indonesia learning, the Indonesian government doesn’t have a test for foreign students yet, like IELTS and TOEFL. Thus, the Indonesian government expected make a Bahasa Indonesia Test for foreign students who want to study in Indonesia, and these students will need to learn Bahasa Indonesia first. “Jumlah Mahasiswa Asing Di Indonesia Meningkat 20 Persen” Pikiran Online. October 6, 2013. Online. “13 Kampus Tiongkok Buka Jurusan Bahasa Indonesia”. RRI. December 22, 2014. Online. “Bahasa Inggris Bahasa Internasional”. Wall Street English. “Mengapa Bahasa Inggris Menjadi Bahasa Internasional?” Kompasiana. December 20, 2014. Online. “Bahasa Inggris.” BelajarIngriss. 2014. Online. At first English lessons in Indonesia only stressed students’ abilities in reading, listening, speaking, and writing, not using language in real-world contexts. But year by year English lessons given in Indonesia began experiencing renewals, that the younger generation of Indonesia students were given English lessons in school not just for the original purpose, but to prepare to cope with the globalization era so that they could take control of their country’s future. The enactment of Curriculum 13 demands that students be able to think creatively. They must be able to do this in all their knowledge areas, whether it’s general knowledge or language knowledge. In this area Indonesian youths are required to compete globally. Competing globally means that they not only have knowledge about English, but also are able to use it as an international language to support their communication with people from other countries. Therefore, in order that we are able to speak English well, it takes a lot of practice. That’s why, English is needed in Indonesia as a mandatory lesson. English lessons provide students with an international language they can use as a communication tool to face globalization, so that Indonesia is not left behind in this global era. As we know, almost all schools in Indonesia are teaching English lessons. This shows Indonesia thinks that English lesson are important to be taught in every school, although there are some of the students consider that English is not too important for them. However, even many students realize English is important. When students from SMAN 10 Malang were asked if English is important, 94% of students said that they felt it was. English will help Indonesian youth’s ability to compete with foreign workers in the ASEAN region, which totals approximately 600 million people (Casmudi 2). The International Labour Organisation (ILO) predicts that by 2015 a professional workforce demand would rise 41% or approximately 14 million positions (Casmudi 2). They also thought middle-class demand for labor would rise 22% or 38 million. But, the low level of employment would increase by only 24% or 12 million (Casmudi 2). This condition is a challenge for youth in the labour market. Facing the MEA (ASEAN Free Market) programs in 2015, it was no exception when applying for a job, and youth often read in the written terms of employment ads, “Spoken in English fluently written & oral”. Moreover, if they enter an international company, then language skills become the main capital in addition to the capabilities of the specifications. When students of SMAN 10 Malang were asked if they believed this was true, 94% also agree with this statement. A few years ago, Indonesian students studied about the English language because it was one of the compulsory subjects for students and they must inevitably follow such instruction. Along with the shift in time and information needs, students and society made English a requirement that cannot be ignored. For example, some colleges in foreign countries do not provide a space at all to candidates who do not have an adequate mastery of the English language. This is characterized by a certain test results requirement (TOEFL, ILETS, and others) as the basis for consideration by the university of prospective new students (Fahrawaty 3). For example, at Ritsumeikan Asia Pacific University in Beppu, Oita, Japan, the admission requirements include that international students must know English, even though the national language of that country is Japan Language (Wikipedia). At SMAN 10 Malang, 64% of students surveyed need English lessons to prepare for their education in university. Making English a compulsory subject in school is a correct policy conducted by the Indonesian Government so that later the younger generation, as the successor of the nation, will not miss out in the association of the international world and be able to compete in a world of globalization, as well as the free market that will confront Indonesia in the end. If English skills possessed by students in Indonesia is very good and universal it will most likely help Indonesia to be ready to face the International Association. Studying English language is one of the most important things that Indonesian youths need to learn and also it is very important for their future in preparing our country to face the globalization competitions in the future. Casmudi. “Kemampuan Bahasa Inggris, Modal Daya Saing Pemuda Menghadapi MEA 2015.” Casmudiberbagi Blog. 5 February 2015. Online. Fahrawaty. “Bahasa Inggris Sebagai Bahasa Internasional Dan Pengaruhnya Terhadap Kurikulum Pembelajaran Bahasa Inggris Di Indonesia”. lpmpsulsel.net pdf. Online. Wikipedia. “Ritsumeikan Asia Pacific University”. wikipedia.org Web. 1 Mei 2013. Online.